Powers/Abilities: Victoria von Frankenstein uses a formula created by her great-grandfather to slow down her aging process. She is a genius with expertise in biology, microbiology, necrobiology, chemistry, alchemy and engineering. She was capable of understanding and working centuries old equipment as well as modern technology including inventing a sophisticated personal anti-viral field in mere hours. Though she was not above using a spray can filled with a flesh-eating as weapon she usually utilized her loyal followers the Children or the Frankenstein Monster (at least in the past) to become physical in her stead. Despite not being a threat to most people and a knack to amend for her ancestors' horrible deeds by aiding those in need (even though it often backfired) she has a reputation to perform horrific experiments on the dead like her ancestors. (Frankenstein Monster#18 (fb) - BTS/Doctor Strange: Sorcerer Supreme#37 (fb) ) - The Swiss Castle Frankenstein was inherited by Victoria, the Baroness von Frankenstein, a direct descendant of Victor (see comments). Within the castle, she found locked away the creations of Basil and Ludwig von Frankenstein. The creations came to be known as the Children, who referred to Victoria as Mother. Knowing the Monster was near Victoria sent the Children into the forest to find him. (Das Monster von Frankenstein#26) - Victoria reiterated how the Monster was ungrateful and had nothing but misery brought to her family, but she forgave the Monster, whom she offered to kiss her hand. When the Monster did Victoria welcomed him to her family and offered him to join her and the Children for dinner. After dinner Victoria called for Igor to bring the Monster to his sleeping quarter while she ordered the other Children to clean up the dinner table and take away the wine, which had secretly been drugged by Victoria. While the Monster lost consciousness in his room Victoria made her way up the tower and laughed maniacally while a storm raged outside. Victoria spouted orders at the Children in her lab at the top of the tower. Some Children pushed a wooden wheel in the cellar to tighten ropes leading up to the tower while others led by Igor carried the Monster from his quarter to the top of the tower. Victoria ordered Janos to get the a helmet, Pjotr to bring her a scalpel, Ajax to get to the bell and wait for her sign to ring it and Bruno to keep her informed about everything he saw on the screens. Victoria threatened to punish them if they did not hurry. Victoria watched as the Children put the Monster on a table and shackled him on to it. She then put a the "helmet", actually a headgear similar to the one used in the past for executions on the electric chair, on the Monster's head, connected the cables leading from it to the spark inductor, then ordered Igor to activate it. Victoria reveled in the suffering of the Monster then had Igor activate the mind screen, which Victoria explained would bring back all the Monster's memories and make him relive them. (Iron Man I#102 (fb) ) - The monster was residing with Victoria (whom he sometimes referred to as the Daughter of Creation) and the Children when she took in and nursed back to health Bram Velsing, a man who had crossed Dr. Victor von Doom, and subsequently had a grotesque mask "bio-fused" to his face. Velsing, however, had plans of his own, and took Victoria hostage, forcing the Monster and the Children to obey him. (Iron Man I#101-102) - Iron Man was shot down while flying over Yugoslavia and crashed a short distance from the Swiss Castle Frankenstein. He was taken back to the castle by the Monster and the Children, in hopes that he could stop Velsing, who was now calling himself the Dreadknight. Velsing, however, ambushed and subdued and bound Iron Man and the monster. The Dreadknight then tortured Victoria, trying to force her to give him the notes of her ancestor, Victor Frankenstein (which she didn't have). Torturing Victoria pushed the Monster too far, and he broke his restraining chains, freeing Iron Man in the process. Iron Man and the monster subdued the Dreadknight, and Victoria agreed to care for him again. (Doctor Strange: Sorcerer Supreme#37 (fb) ) - The monster stayed with Victoria for a time, but eventually left, to go his own way. Victoria learned that Borgo, the former servant of her father, had not perished in his fall from the castle. Instead, he had been crippled, and lived under the care of a local family. Victoria, feeling that her family had been responsible for Borgo's fate, took him in. Once back in the castle, Borgo duped Victoria and the Children into using the X-Machine on him. While he told them it would heal him, it instead made him into a version of what has been called...the "Frankensurfer." Borgo imprisoned Victoria and the Children in the castle's dungeons, and set out on a rampage. (Doctor Strange: Sorcerer Supreme#37) - Frankensurfer's actions attracted the attention of Dr. Strange, who freed Victoria and the Children, and then battled the Frankensurfer, who planned to slay Victoria so she could never reverse the process that had turned him into the Frankensurfer. 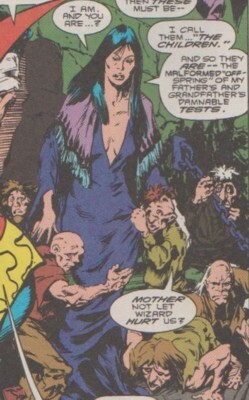 Strange took the blast and Frau Müller, who had previously cared for Borgo, rushed to Strange to care for him as well. Borgo accidentally slew her and in his grief crashed into a nearby mountain, killing herself. Victoria watched Strange fly away after leaving the body of Borgo in the care of Herr Müller. (Spider-Man Unlimited I#21 (fb) - BTS) - The surprisingly alive hunchback Ivan, who had allied with Dr. Walston Kraft in a plot to create an army of Frankenclones, located the monster at the Swiss Castle Frankenstein, convinced him that Kraft could make him into a real man, and took him to Kraft's Swiss Castle. Ivan later returned to Castle Frankenstein and imprisoned Victoria Frankenstein to prevent her from interfering. (Spider-Man Unlimited I#21) - Spider-Man flew to the Alps to cover a story on Kraft and the International Council on Cloning and Genetic Research. Peter knew something was up after running into the monster and Ivan, who threatened him while he was snooping around Kraft's castle. Peter traveled to Castle Frankenstein, where he found and freed Victoria, and learned what had been going on. Spidey exposed the plot to the Monster, and they destroyed Kraft's lab and foiled his plot. The Monster left Peter to return to Castle Frankenstein. 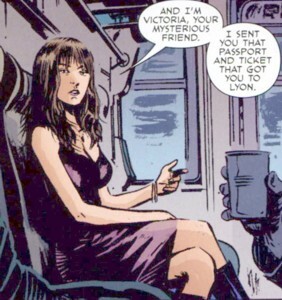 (Hulk Monster-Size Special#1 (fb) - BTS) - Victoria sent Bruce Banner a fake passport and a ticket that secretly brought him to Lyon, but the Hulkbusters caught up to him nonetheless and managed to drug and capture him. Victoria's ally Fritz, one of the Children, managed to save Banner from them and brought the unconscious Banner to Victoria. (Hulk Monster-Size Special#1) - Banner woke up in a train cabin in Austria with Fritz and Victoria besides him. Victoria introduced herself as his mysterious ally and asked him to aid her with his expertise. Arriving at the Swiss Castle Frankenstein Victoria explained her family's history a bit to Banner and how a formula developed by her great-grandfather had slowed down her aging process. She was actually 73, which impressed Banner. She then brought Banner to her lab where she asked him to help her with his knowledge of physics and biology to keep the Frankenstein Monster, whose cellular structure was breaking down, alive. For weeks Victoria and Bruce worked together to graft new flesh on the Monster and replace spent organs. A day off the spent at the local market where people didn't like Victoria much because they knew who she was. Despite following all instructions and replicating the formula the progress on the Monster slowed down the next few days as if something was missing. Victoria already knew what was missing and knocked Banner out with ether. (Hulk Monster-Size Special#1 - BTS) - While Banner was out Victoria gave the Monster a blood transfusion from Banner due to the regenerative abilities of Banner's blood. 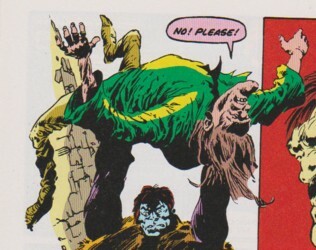 (Hulk Monster-Size Special#1) - When Banner came to he found himself bound to a slab and learned what Victoria had already done and then learned that she would use her ancestor's energy transferrer to awaken the Monster once again by tapping into the energy released from Banner's alter ego the Hulk. Triggering Banner's transformation into the Hulk the energy transferred from him successfully brought the Frankenstein Monster back to life. An angered Hulk threatened Victoria for taking his blood, but Fritz tried to hold him back with a torch, to no avail. Hulk grabbed Victoria at her throat when the awakened Monster came to her aid. Victoria and Fritz watched the Hulk and the Monster fighting each other and she was impressed how the Monster could actually hold up against the Hulk because he had absorbed the power from Banner's blood. When Fritz revealed he had called the Hulkbusters to deal with the Hulk Victoria was shocked. Fritz did it to prove his love for Victoria and tried to force her to flee with him, but the Monster told Fritz to let Victoria go. Victoria tried to convince the Monster, whom she called Adam, to leave before the Hulkbusters came for him next, but the Monster decided to aid the Hulk first. After defeating the Hulkbusters together the Monster left with Victoria. (Wolverine VI#12/3 (fb) ) - Victoria had a drink at the 113 bar when Scorpion and Shocker brought in an injured Looter. Scorpion told Max Moore, the bar's owner, he had to hide them quickly, but Victoria objected. She introduced herself to the villains and realized that they knew who she was. 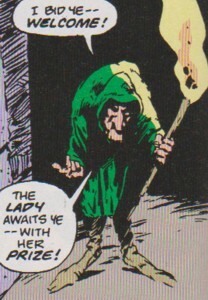 She offered to treat Looter's wounds, but in return the villains were never to return to this bar and they had to tell all other villains that they were to stay away as well. After the villains left Victoria explained to Moore that villains were afraid of her because they didn't want her to be waiting for them after they had died and they also knew what she could send after them. Moore thanked Victoria and promised her free drinks for a year. In return Victoria explained that this bar was something special and she didn't want it to become another one of the villain bars she sometimes frequented. She asked Moore to create rules for his bar. (Wolverine V#4 (fb) ) - Victoria had a drink with Logan at the Guernica bar and asked him why he had never done more with his powers like deliberately increasing his speed. She suspected that he had probably already experienced speed increase a few times during his berserk moments and that it was probably extremely painful due to leg muscles burning out against the levers of his Adamantium bones before they healed again. Logan replied that he was used to ignoring pain. (Wolverine V#3) - Six weeks later after Wolverine was shot by an alien weapon from the Microverse he called Victoria to come to the Guernica bar where he and Nick Fury Jr. met with her. She mentioned how only her friends knew she was alive because of the things (the Frankenstein Monster) that would otherwise kill her. 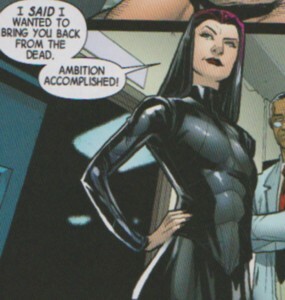 The owner Max Moore gave them the back room where Victoria operated on Wolverine on the pool table, necrotizing his flesh to keep it from regenerating until she could remove the alien bullet, which she placed in a negative flask to contain a possible explosion. The negative flask gave them a reading on the exotic metal alloy the bullet was made off and they found out that it was empty inside. Wolverine asked Victoria and his other allies at the bar, including NYPD Detective Chieko Tomomatsu, oddsmaker Robert Templeton, comic book author Marcus H. Harold, scientist Dr. Jason Rivera and Damage Control's boss Anne-Marie Hoag if anyone of them had ever seen something like this bullet before. Before they could come up with anything Wolverine and Nick Fury Jr. left to deal with an alarm at Blenkin Pharmaceuticals where the autopiloted weapon Wolverine was shot with had landed. (Wolverine V#8) - Victoria joined Nick Fury Jr. and Storm on a mission to the virus-controlling Host from imprisonment in Wakanda. They found the prison guarded by soldiers controlled by the same sentient virus from the Microverse Wolverine had been infected with. Storm cleared a path to the prison by knocking out the guards with electricity. More virus-controlled troops closed in on their location and attacked the prison, but they were defeated by troops sent by Black Panther. Victoria woke up and freed the Host from her stasis tube prison and Nick Fury Jr. and the others explained the situation to her. When Victoria and the others met with Wolverine and Black Panther Victoria made it clear that they had caught the Host's interest in this sentient Microverse virus. (Wolverine V#10) - Victoria met with the other experts at the Guernica bar during a worldwide communication blackout that, to Victoria's surprise, even affected latveria.doom. They were sure the sentient Microverse virus was responsible. They thanked Victoria for protecting them from the sentient virus with an anti-viral field invented by her, which according to Harold could protected the whole world. Victoria replied the anti-viral field was too expensive to mass market and assumed the president was either taken over by the virus or deemed it was too dangerous to make it publicly available as the panic to get it would be more deadly than the virus' invasion. (Wolverine VI#1) - Victoria had a drink at the Guernica bar where she ran into Storm and Wolverine. Victoria told Wolverine how she fantasized about bringing him back from the dead at some point since he had lost his healing powers due to the sentient Microverse virus. Logan got angry and Victoria was sorry for mentioning it. 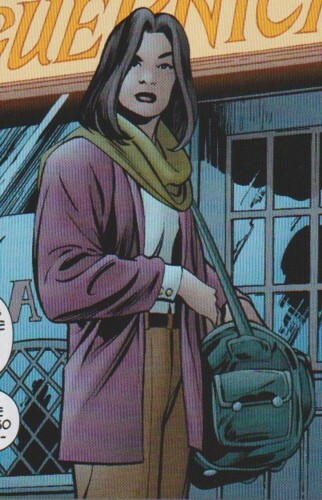 (Wolverine VI#10) - Hanging out at the Guernica bar with the other experts she had a drink when Wolverine entered to everyone's dismay because he had become a villainous mercenary. The mood changed when Templeton told the others that Wolverine had just been reinstated as an Avenger because he had been working undercover the whole time. Sabretooth's Hand ninjas attacked the bar and during the fight Victoria used a spray can with flash-eating bacteria to fight them alongside the other experts, who were not that defenseless as they seemed, and Wolverine. Thor came to their aid to end the fight against the Hand. Victoria stood by while Rivera found out which building Sabretooth was using as his base and then watched Wolverine leave with Nick Fury Jr. and SHIELD as his backup. (Wolverine VI#12/1) - Wolverine died from his wounds after fighting Sabretooth, but Victoria and a bunch of doctors brought him back to life. Victoria was proud she had accomplished this little dream of hers. Comments: Created by Bill Mantlo (writer) & Val Mayerik (artist). 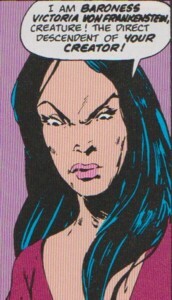 The events of this story was mentioned in Peregrine's profile in the All-New Official Handbook of the Marvel Universe Update#3 (September, 2007). The story from the German comic Das Monster von Frankenstein#26 is a direct continuation of Frankenstein Monster#18, which was published in the series' previous issue #25. The story was written by the series' translator and never reprinted outside of Germany, making its canocity within the Marvel Universe kind of questionable. Like Frankenstein Monster#18 before the story ended on an unresolved cliffhanger as the promise of another German story called "Vieltausendfacher Tod!!!" (English: Many thousand times death!!!) for the next issue never came to fruition. 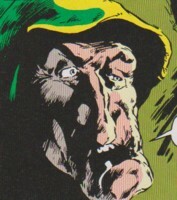 The next issue instead featured a reprint of the Frankenstein's Monster story from Monsters Unleashed#2 (September 1973). Igor is a reference to a recurring character in Frankenstein movies. The character first appeared (though identified as Ygor) in Son of Frankenstein (1939) played by Horror movie legend Bela Lugosi and became a staple of the franchise returning in numerous movies since then. 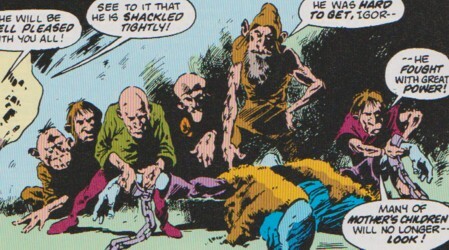 Igor's appearance in Mel Brooks' Frankenstein Junior (1974) seems to be a huge influence in Marvel's version of the character. 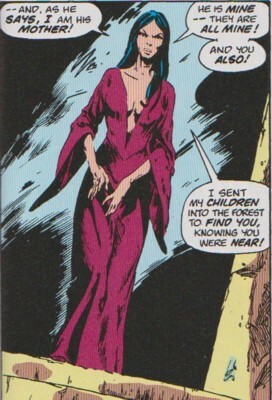 Victoria's claim in Iron Man I#102 to be the great-granddaughter of Victor von Frankenstein is false according to the extensive background information on her family in Doctor Strange: Sorcerer Supreme#37. Victoria's claim to be 73 years old in Jeff Parker's Hulk Monster-Size Special#1 works fine, but one has to wonder how old her sister Veronica was when we first saw her. It would've also worked if Victoria truly was a distant cousin of Veronica descended from a family line started by a short liaison of Victor in the 1700s mentioned in Jean-Marc Lofficier's unpublished Marvel Comics Presents storyline. Profile by Snood & Markus Raymond. The Children (or Children of the Damned) are malformed creations of Basil and Ludwig Frankenstein. Apparently, they were their failures, and they were kept down in a dungeon in the Swiss Castle Frankenstein. When Victoria inherited the castle, she found and released the Children. They are fiercely loyal to her, and while it is unknown if they possess any superhuman abilities, or any degree of skills whatsoever, they are more than willing to fight to the death for her. Through shear weight of numbers, they proved capable of destroying the Berserker android, as well as subduing the Frankenstein monster on one occasion. Nonetheless, without Victoria, their "Mother", they are lost. Note: Some of them were identified by name in the Germany-exlusive story in Das Monster von Frankenstein#26. Those named solely in this story included Ajax, Bruno, Janos and Pjotr. Fritz was one of the Children. He was secretly in love with Victoria. When she needed Bruce Banner's aid to save the Frankenstein Monster Fritz abducted Banner from a car after Banner was drugged by a member of the Hulkbusters. He was present in a train cabin in Austria with Victoria when Banner awakened. He kept serving Banner and Victoria throughout their endeavor to save the Monster, but called the Hulkbusters on Banner because he feared Banner would turn into the Hulk and hurt Victoria after she used his blood and energy as the final steps to revive the Monster. When his fears became reality Fritz unsuccessfully tried to scare away the Hulk with a torch, but the Monster awakened and succeeded to protect Victoria from the Hulk instead. While Victoria watched the fight between the Hulk and the Monster in awe Fritz revealed that he had called the Hulkbusters to take out the Hulk. He proclaimed his love for Victoria and tried to force her to flee with him after he had saved her for so many times. The Monster ordered Fritz to let Victoria go and lifted Fritz up by his throat, but dropped him to returned to aid the Hulk against the Hulkbusters before leaving with Victoria himself. Fritz's fate is unknown (maybe the Monster just broke his neck while he was in his grasp or he merely choked him out). Note: Though he was first identified in Hulk Monster-Size Special#1 he was possibly active throughout Frankenstein Monster#18, Das Monster von Frankenstein#26, Iron Man I#101-102, Dr. Strange: Sorcerer Supreme#37 and Spider-Man Unlimited I#21. Igor was one of the Children, a past experiment of one of Victoria's ancestors. (Frankenstein Monster#18) - When the Children arrived with the Monster at gate of the Swiss Castle Frankenstein Igor answered the Children's call and welcomed them with a lit torch in his hand. He watched them drag the Monster into the castle and ordered them to chain the Monster to a wall. He knew their Mother would be pleased to finally have the Monster in her grasp. When the Monster broke free from the chains upon regaining consciousness Igor came to the other Children's aid and tried to scare the Monster with the lit torch. Though the Monster recoiled at first it fought back and after hitting Igor a few times lifted him over his head to finish him, but Victoria arrived and ordered the Monster to put him down and the Monster obliged. Igor thanked Victoria. Note: Igor hasn't been seen since and it is unclear whether he was BTS and less prominent in the Children's later appearances or if he was actually gone. He was clearly taller than the others and stood out enough to not be just another nameless member of the Children.